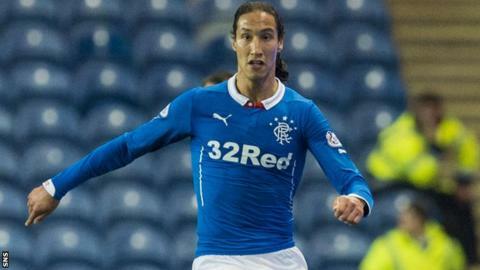 Rangers defender Bilel Mohsni looks likely to leave Ibrox, with German side Freiburg favourites to clinch his signature. The Tunisia international is among 12 members of Stuart McCall's squad who are out of contract this summer. Mohsni, 27, signed for Rangers in July 2013 and has made 41 appearances. "Bilel is out of contract at the end of the season and it doesn't look like he is going to stay at Rangers with the way things are going," a source said. "There has been contact with clubs, not only in Germany. He is an international player so he attracts interest. "There is nothing definite at the moment, whether it's from Germany, France or anywhere else. He is still undecided about what he is going to do in the future. "He would have loved to stay at Rangers but the way things are, he doesn't seem to be welcome. "It's not like he wants to move on but he is out of contract and has to look at his options. "However, Bilel won't sign anywhere until the season ends in Scotland." Rangers face Queen of the South over two legs in the Scottish Premiership play-offs, with the winner facing Hibernian in the semi-finals. A win there would set up a two-legged tie against the team finishing 11th in the Premiership.